Gutters may be built to handle the worst weather Florida can throw at a home, but they aren’t impervious to weathering. Gutters can suffer damage from all sorts of sources. Fortunately, regardless of the issue, the L & J Gutters team is here with a solution. Let’s take a look at a few problems that can damage your gutters. Gutters are actually relatively complex builds. A given gutter can contain gutter piping, attachment brackets, hangers, connectors, elbows, downspouts, end caps, and possibly, a leaf grate. Improper installation can cause any one of these components to fail. Most often, brackets and hangers aren’t properly installed. That can cause sagging or a complete break along the gutter structure. Also, gutters are often installed with connection gaps. That will result in a leaky gutter, or it can cause your gutter to break apart altogether. Gutters shouldn’t leak and they shouldn’t sag. If yours do, your gutter installer may be to blame. Luckily, help is on the way! L & J Gutters provides professional gutter repairs and replacement, so you can rebuild the integrity of your gutter system. Trees are seemingly docile living things, but a dead branch can be rather damaging with a bit of gravity. Dead tree limbs can fall and damage gutters. It’s best to monitor the trees around your property to look for “widowmaker” branches, and to cut them down before damage can occur. However, a good storm can break some of the least suspect branches, leaving you with a damaged roof and gutter. Tree branches can also damage gutters if they get caught in a heavy wind, or if the tree is allowed to grow into the gutter system. 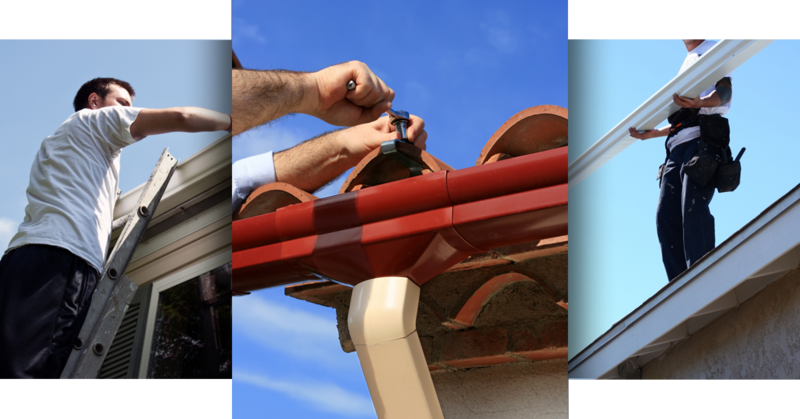 Regardless of the issue, we can fix or replace your gutter system. Gutters are built to stand the test of time, but nothing lasts forever. Depending on the gutter material, gutters can last between two decades and half of a century. Copper gutters are especially strong (and they look great! ), so you can expect them to perform as they should for about fifty years. If your home is more than a couple of decades old, your gutters may be as well. Take a keen look at your gutter system. It might be time to replace the whole thing. Gutters can easily be damaged by roof work. You should never place a ladder against a gutter (the weight can damage the structure and collapse the gutter). In addition, a falling tool can damage your gutters, or loose shingles can get caught in your gutter system. If you’re having any work performed on your roof, make sure that you hire a professional outfit that’s conscious of your gutters. Mistakes do happen; we’re here to repair those damaged gutters. Here at L & J Gutters, we specialize in gutter repairs and replacement, as well as our gutter manufacturing and installation services. We’re headquartered in Freeport, and provide gutter repair services for folks throughout Walton, Okaloosa, and Bay Counties. If you’re curious about our gutter services, don’t hesitate to get in touch with us, or if you’re ready to get started, you can get an estimate for your gutter project.